Andy Powell is one of the modern era's great characters and has a big following for his performances on the field as well as his high profile exploits off it. No.8 Powell's emergence into the Welsh set-up was a long and often frustrating road, with his career having taken in stints at Newport, Beziers, Scarlets and Cardiff Blues. Joining the Blues in 2005, Powell's direct and muscular style of play earned him a run in the side until a debilitating run of injuries threatened to end his career. Powell's return to the Blues' first team came following an injury to talismanic Kiwi Xavier Rush, but some outstanding performances against Gloucester in the Heineken Cup and Leicester in Anglo-Welsh competition led to his first cap against the Springboks in 2008. He was selected for the 2009 Lions tour of South Africa but started in bizarre fashion when an insect bite ruled him out for the first tour match. Powell's tour was a mixed one, with his performances improving as it progressed, although he was a major success among his team-mates. Following a win over Scotland in 2010, Powell was arrested and charged with drink-driving after taking a golf buggy from the team hotel and driving to a nearby service station. He was subsequently dropped from the Wales squad with immediate effect and banned from driving for 15 months. In the summer of 2010 he negotiated a release from his contract with the Blues in order to join Wales coach Shaun Edwards at Wasps. 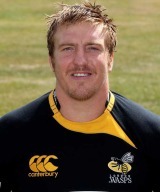 owell spent a year at Wasps and turned in 14 appearances for them in the Premiership. But on May 5, 2011, Powell was involved in bar brawl in London which propelled him back onto the front pages. Powell left Wasps by mutual consent and took up a contract at Sale. Powell went to the 2011 World Cup with Wales and turned in four appearances for them in New Zealand. He was part of the 2012 Six Nations squad, but only made one showing from the bench in their match against Scotland. But while his international career was stalling, for Sale he was playing some of the best rugby of his life. Despite previously saying he was keen on renewing his contract with the Sharks, in April 2013 he announced his switch to rugby league after taking up a three-year deal with the Wigan Warriors.